As promised in my previous post, a free pattern! 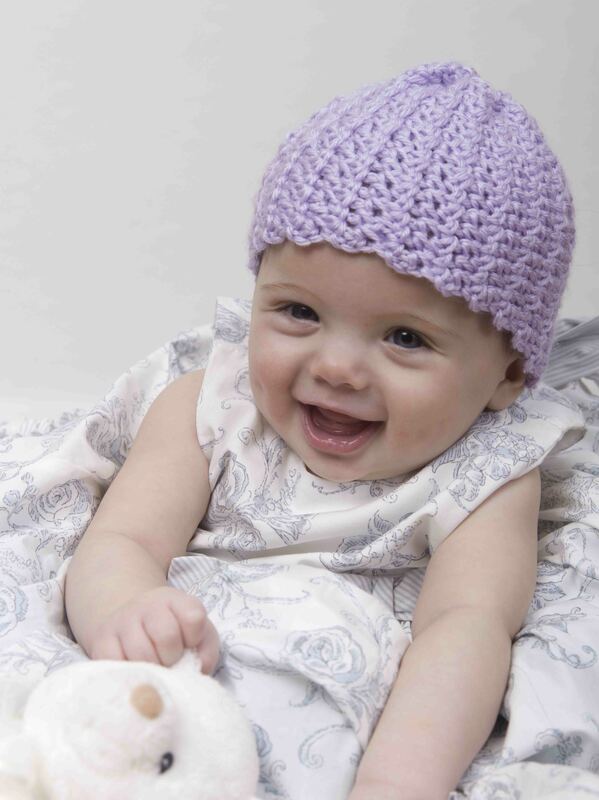 Learn about the Click for Babies Campaign and get the free pattern for my Purple Baby Hat design at Crochet 1-2-3. Here is another one of my patterns that has been offered as a free pattern on Naturally Caron’s website. I’ll work at listing my other Naturally Caron patterns here over the next few weeks since Caron has pulled all of their Naturally Caron free patterns. 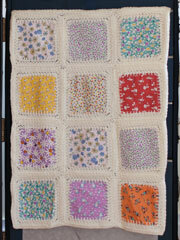 The Dewdrops Baby Blanket was made in Naturally Caron Joy! yarn, but can make it in any worsted weight yarn. GAUGE: In pattern, 5 pattern repeats = 8″/20.5cm, and 8 rows = 4″/10cm. Gauge is not critical for this project. NOTE: To change color, work last stitch of old color to last yarn over. Yarn over with new color and draw through all loops on hook to complete stitch. Proceed with new color. Fasten off old color. With larger hook and A, ch 122. Row 1: Sc in 2nd ch from hook, sk next 2 ch, 5 dc in next ch, sk next 2 ch, sc in next ch, *sk next 2 ch, 5 dc in next ch, sk next 2 ch, sc in next ch; repeat from * across; change to B in last st, turn—Twenty 5-dc shells. Row 2: With B, ch 3 (counts as first dc here and throughout), 2 dc in first sc, sk next 2 dc, sc in next dc (center dc of 5-dc shell), sk next 2 dc, *5 dc in next sc, sk next 2 dc, sc in next dc, sk next 2 dc; repeat from * across to last sc, 3 dc in last sc; change to A in last st, turn—Nineteen 5-dc shells and one 3-dc half-­shell at each end. 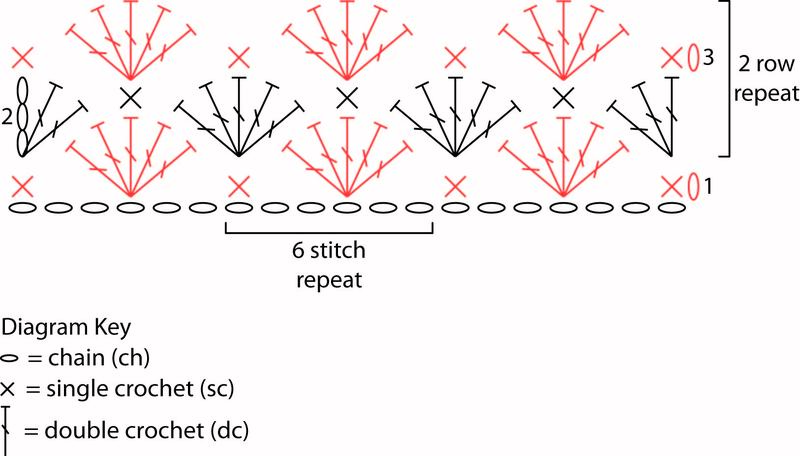 Row 3: With A, ch 1, sc in first dc, sk next 2 dc, 5 dc in next sc, sk next 2 dc, *sc in next dc (center dc of 5-dc shell), sk next 2 dc, 5 dc in next sc, sk next 2 dc; repeat from * across to turning ch, sc in top of turning ch; change to C in last st, turn. Row 4: With C, repeat Row 2; change to A in last st.
Row 5: With A, repeat Row 3; change to B in last st.
Row 6: With B, repeat Row 2; change to A in last st.
Row 7: With A, repeat Row 3; change to C in last st. Rows 8–63: Repeat Rows 4–7 fourteen times; do not change color at the end of Row 63. Do not fasten off A. Border: Change to smaller hook. Round 1: With A, work sc evenly spaced around all edges of blanket, working 3 sc in each corner; join with sl st in first sc. Round 2: Ch 1, sc in each sc around, working 3 sc in each corner; join with sl st in first sc. Round 3: Ch 1, sc in same st as join, *ch 2, sk next sc, sc in next sc; repeat from * around, ch 2; join with sl st in first sc. Using yarn needle, weave in all ends. Block lightly, if desired. 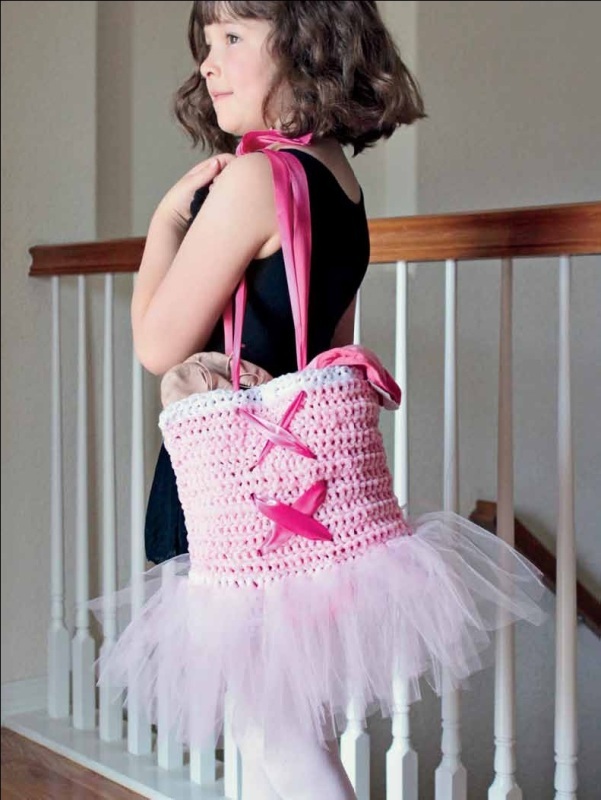 One of my latest patterns, the TuTu Cute Tote Bag, is available for free on the Love of Knitting/Love of Crochet website as a web-bonus pattern in their latest issue, Weekend Crochet Projects. I just love this design, which I made to resemble a ballerina ensemble complete with tutu and the criss-cross ribbon of a laced up ballerina slipper. available in the same issue. There are a lot of great patterns, so check it out! And today I sew! But doesn’t this make a pretty picture? In case you were wondering, there are 80 squares and I started the first one less than two weeks ago. How’s that for progress? Check Out My Designs on Knit and Crochet Now! 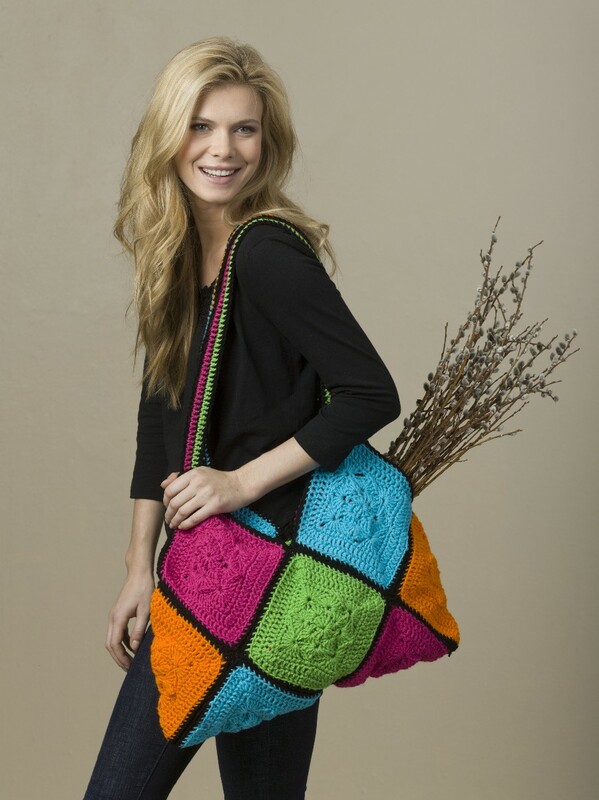 Last fall I was fortunate enough to have the opportunity to do some crochet designs for the Knit and Crochet Now! show. Those episodes are airing this month and next (check your local station for scheduling). 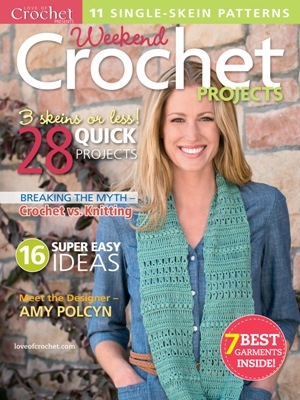 Patterns are available for free download from the Knit and Crochet Now! site. You just have to create an account if you haven’t already. My Quantum Geo Throw is featured in episode 304. 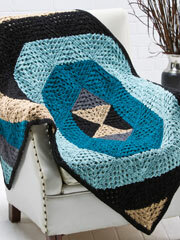 This throw also just appeared in the winter 2012 issue of Crochet! Magazine. 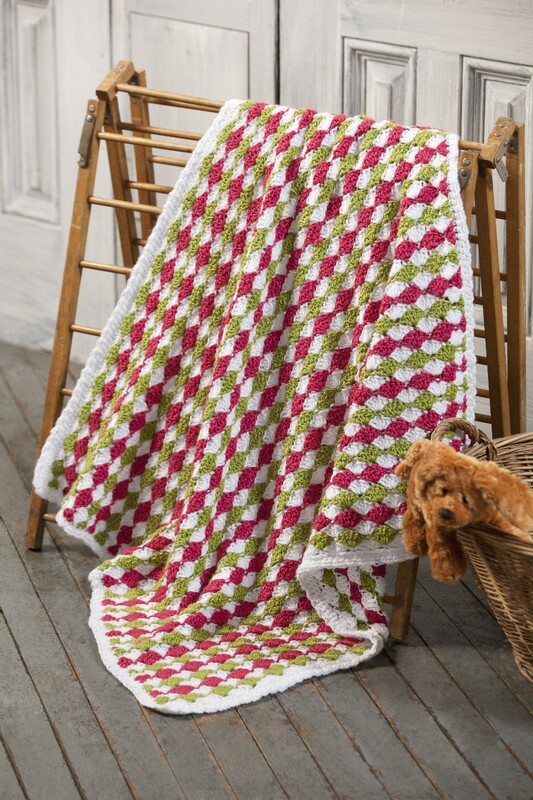 Download the pattern for the Quantum Geo Throw from the Knit and Crochet Now! site. My Shell Stitch Lamp Shade Cover is featured in episode 306. It will dress up any plain lampshade. 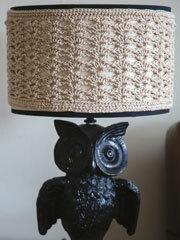 Download the pattern for the Shell Stitch Lampshade Cover from the Knit and Crochet Now! site. The Squared Away Baby Blanket was a lot of fun to make and you can find this featured in episode 308. 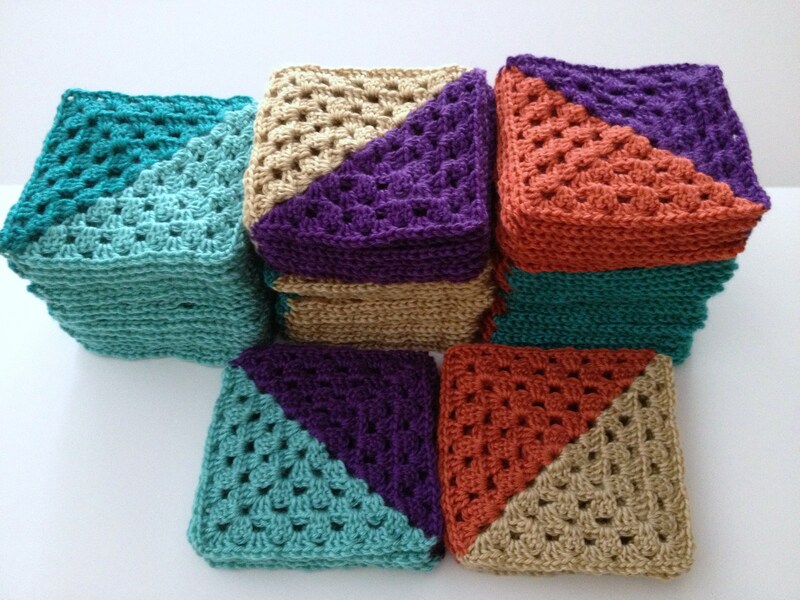 Download the pattern for the Squared Away Baby Blanket from the Knit and Crochet Now! site. 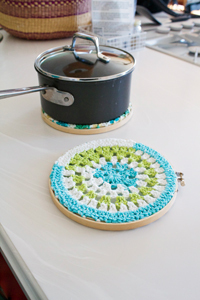 My Round ‘n Round Rug, featured in episode 301, is easier to make than it looks. And remember, you can watch Knit and Crochet Now! episodes to get helpful demonstrations on all of these projects! 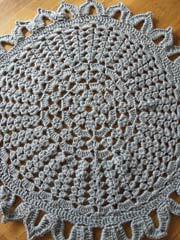 Download the pattern for the Round ‘n Round Rug from the Knit and Crochet Now! site. So Much to Crochet, So Little Time! 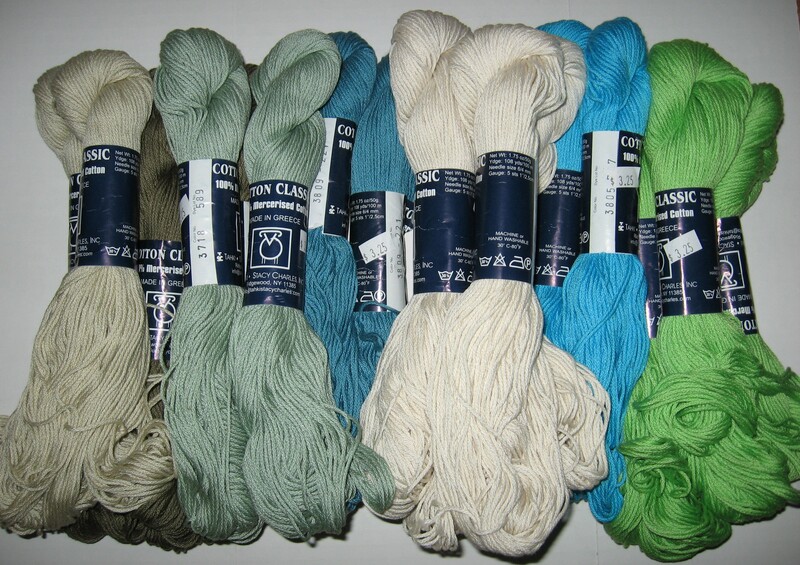 I’ve been teaching a crochet class at my local yarn store and this week as I was waiting for the students to arrive, I discovered a clearance bag full of Tahki Classic Cotton for just $3.25 each! Between myself and a few of my students, we promptly put a huge dent in the supply. I bought 17, yes 17, hanks of it. As much as I wanted it all, I carefully selected quantities and colors based on projects I already have planned! I can’t wait to get started! I also want to pass along a huge THANK YOU to my fellow blogger For the Knit of It! I just received my Cascade Hand Dyed Jewel yarn that I won in her anniversary giveaway! I can’t believe I won– I never win anything! 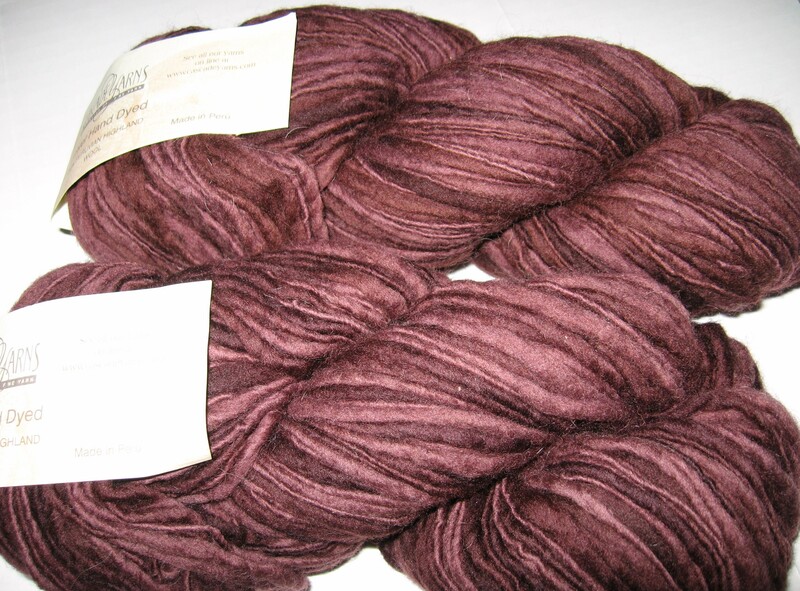 I love the beautiful plum tones of this yarn. I have to decide on the perfect project to use this yarn for.